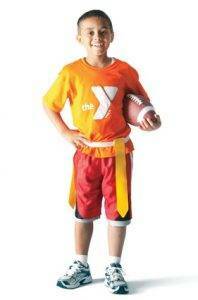 Does your child love to pass, catch and run a football? If so, our flag football youth league is designed to introduce boys and girls, (ages 4 to 12) to the fundamental elements of football in a fun, instructional and safe environment. From the moment your child steps on the field, our program is designed to assist each player with the advancement of their individual skill level and football knowledge while enhancing their level of play in a fun and structured environment. Everyone plays (automatic sub rotation)! Players will receive 8 games, a weekly instructor-led practice session, instructor coach, league t-shirt and awards. Practices are optional but highly encouraged for skill development.